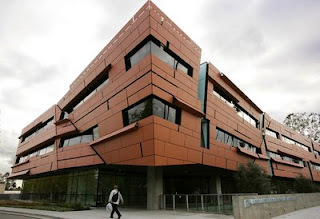 After 60 years of waiting for a new facility to house their eminent physicists and astronomers, Caltech opened the new Cahill Center for Astronomy and Astrophysics on January 26, 2009. The $50 million facility will become home to between 200 and 300 researchers and nearly 10% of Caltech’s faculty – 26 professors – will occupy the Cahill Center. Previously, Caltech’s cadre of talented graduate students, postdocs, and research scientists were dispersed among several buildings across campus. During the past few years, I mostly frequented the historic East Bridge, home of many of Caltech’s world famous faculty such as Kip Thorne. Now with Cahill, the group will be brought together in a uniquely artful setting designed to promote intellectual collaboration. The building’s distinctive purpose begins with its street address at 1216 California Blvd. near the southwest corner of the campus – 1216 being the wavelength, in Angstroms, of a far-ultraviolet line in the spectrum of hydrogen, known as the Lyman alpha line, that for decades has provided observational astronomers with a goldmine of information about a wide range of cosmic phenomena. The center was named after benefactor Charles Cahill a retired producer of educational films who has followed Caltech astronomy since the 1950s. The Cahill Center is Caltech’s first building to achieve gold-level certification in the U.S. Green Building Council’s Leadership in Energy and Environmental Design (LEED) rating system. I’ve been to the new Cahill Center twice already, both times to attend LIGO seminars sponsored by CaJAGWR (Caltech-JPL Association for Gravitational Wave Research). The seminars are held in the beautiful and very high-tech 148-seat Hameetman Auditorium. Whenever I’m there, it feels like a privilege to be in a place that arguably may be the center of the universe for astrophysics research.